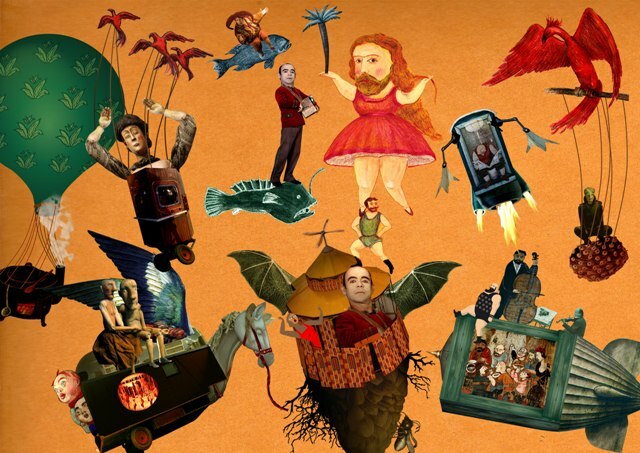 How do the internationally renowned theatre artists from Prague create an impression based on theatre traditions as well as modern artistic effects? How does the combination of process and relationship work for them as a travelling theatre? This are the quetions raised by the exhibition created by Matej Forman and his Froman Brothers Crew, at the KunsCentret Silkeborg Bad, during the last Festival of Wonder. From 21th September to 5th january 2014. Article by Iben From and Ulla Dengsøe. Josef Sodomkas’ collage is a picture of movement and the eternal journey in theatre, as well as the theatre room as a place where anything can happen and normalcy is suspended. At the bottom middle is Petr Forman. For an audience, sitting in the dark in a theatre is a matter of surrendering oneself for a short time to the atmosphere and the stories created by actors, designers, puppeteers, lighting designers and all others involved in the production of a performance. Surrender is necessary, and if it happens, theatre art can open new rooms and allow new thoughts to the viewer, who is part of a common experience with the other people who have chosen to be in the audience at that same time. Only that little group is in the new room. The next show will be slightly different, because human beings are on stage and audiences change. Theatre Forman Brothers from Prague was created by Petr Forman and Matěj Forman (sons of Milos Forman). 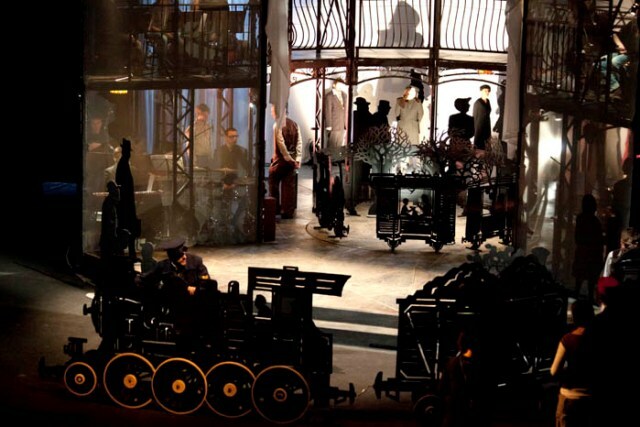 Since the beginning of the 1990s they have continued to develop the methods of the theatre, so that today they are considered one of the foremost theatres in modern European theatre art. They do not have their own stage, but instead work in relation to the venues where they see possibilities, in Czech Republic and throughout Europe. 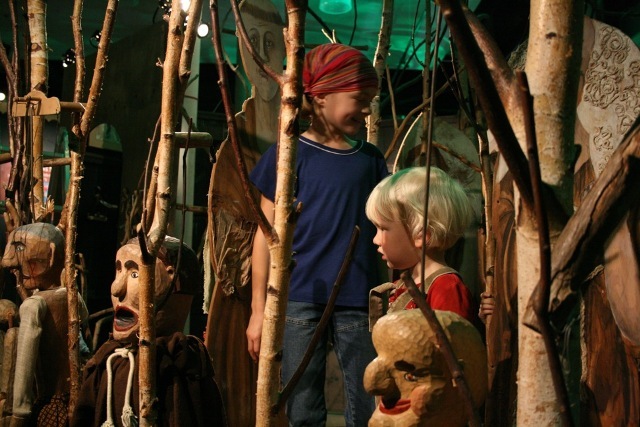 This year Theatre Forman Brothers is the subject of a large exhibit at KunstCentret Silkeborg Bad, which takes place in cooperation with the international puppetry festival in Silkeborg, Festival of Wonder. Matěj Forman and his colleagues would like to take the audience on a journey behind the scenes in the world of their theatre. Some of the 3 dimensional elements of the sets will be built in the exhibit, with the intention of audience interaction. 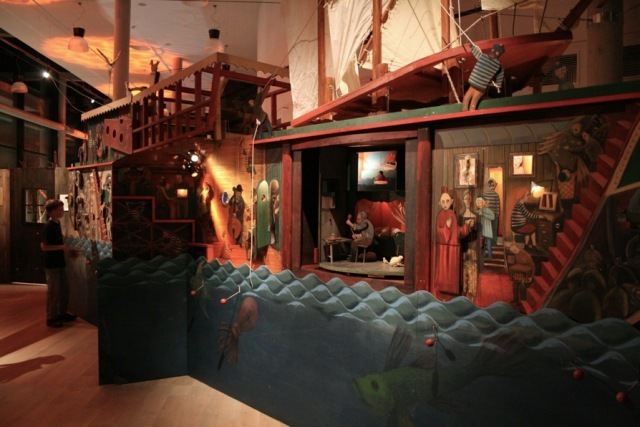 Copy of the ship “Mystery”, constructed by Josef Sodomka in connection with the performance “The Purple Sails”. The boat includes a small movie theatre, in which the film about Purple Sails and several other films by Miroslav Janeks will be shown, leading the audience to new horizons. Photo: Theatre Forman Brothers. The intention is to demonstrate some of the mobility of the theatre, the nomadic life and its temporary character. The visitor will notice the constant change of a travelling theatre, which develops and varies according to the places and the people met on the road. This includes travelling in campers and trailers, elements of freak shows, classical circuses and old-fashioned markets. Of course it can be a challenge to translate the life and work of a theatre in action to an art exhibit, in which the audience is viewing an empty set. This challenge is met by Matěj Forman by interacting with the audience and by using projections which illustrate live performances. For the youngest visitors to the exhibit for the senses, there will be a special children’s studio. Elements from the travelling theatre will be integrated into the exhibit: sets and parts of set decorations will act as art installations. 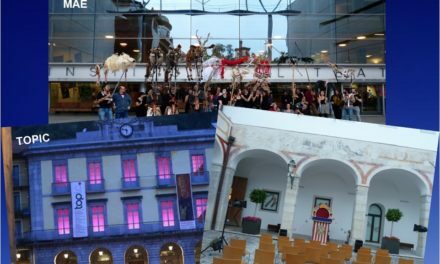 Instead of seeing one show, the viewer will get an insight into the theatre process with many different performances, including ”Obludarium”, ”The Baroque Opera”, ”La Baraque – Bouda”, ”Kráskazvire” (the opera of Beauty and the Beast), the musical ”A Walk Worthwhile”, the opera ”Čarokraj”, the opera ”Rusalka”, ”The Hunchback from Notre Dame”, ”Wedding Shirt” and the puppetry performance ”Farmer, Devil and Hag”. Matěj Forman, the anchor behind the exhibit Theater in Movement – People and Puppets on Stage, has prepared the project in close cooperation with artist colleagues with respect for the importance of the many different pieces of the finished work. Because of their method of working, Theatre Forman Brothers has a large network around Europe, among others, artists Pavel Macek, Stáňa Stuchlá (Limoges), Josef Sodomka (Prague), Irena Vodáková (Prague) and Bärbel Haage (Dresden). For lay people, as well as professional visual and theatre artists, this exhibit, for the first time in Denmark, allows for a rare glimpse into a world which otherwise only exists on stage. It is also a meeting between the worlds of visual arts and performance arts, which usually take place in different venues. And this is especially a unique chance to meet Theatre Forman Brothers and the work they have put into practice on an international scale. Interaction with and examination of the new room, created by the artist in the exhibit. Puppets come alive and people participate as figures in the installation. Photo: Theatre Forman Brothers. 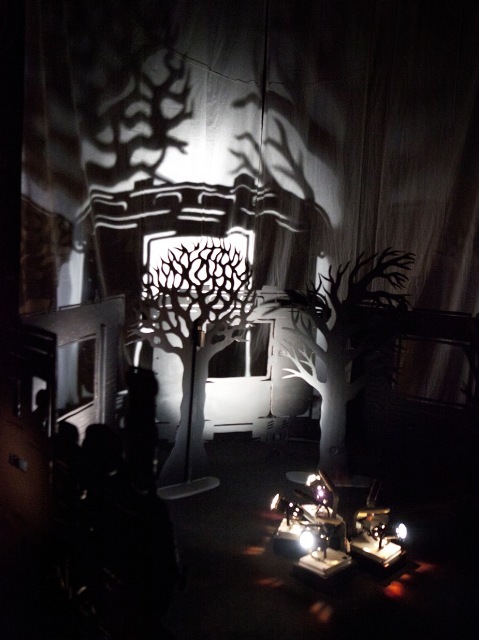 As in all visual art, contrasts between light and dark are important effects in set design. Theatre allows for great possibilities using shading to create mood or to challenge proportions. Photo: Theatre Forman Brothers.